Potluck meals are usually an amazing conglomeration of ideas, talent and traditions. A few of my favorite recipes came from these shared meals because most cooks willingly include or share their recipes. There is a certain green, foam salad that frequently shows up at potlucks every now and then...I never think to make it myself even though I love it. If I see that salad, I practically elbow others out of the way just so I can have some. As crazy as it sounds, I do not have that recipe anywhere in my collection, yet! I love inventive salads. The only time I ever ate a three-bean salad was at a smogasbord or potluck dinners. It was not one that my mother ever made. The fact that the salad was hot made it unusual and the use of beans made it very unusual! 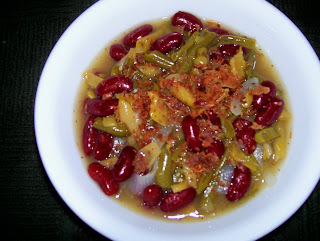 A wilted spinach salad probably comes the closest in flavor to this tangy bean dish, but it was definitely an inventve person who figured out that bacon and vinegar would make three kinds of beans blend together like old friends. Because of the fat content, I could never, in good conscience, fix this salad more than once or twice a year...but, I think the phrase, "Everything in moderation..." seems to work well here. Happy eating. Cook bacon in a large pot until crispy. Remove to paper towels to drain; reserve drippings. Crumble bacon into a small dish. To the bacon drippings, add next five ingredients and stir well. Cover and over med heat, bring to a boil. Reduce heat, uncover and cook, stirring constantly until thickened. Add beans and onion slices. Cover and cook over med heat 10 minutes or until onion is tender. Stir occasionally. Just before serving, sprinkle with crumbled bacon. Serve hot.